The initial registration numbers are in for minor football in Taber, and its president hopes to hit the century mark when all is said and done when locals hit the field in the fall. “We have 43 registered as of today,” said Jason Jensen, president of the Taber Football Association, after attending a board meeting last Wednesday. With programs in atom, peewee, bantam and high school, the high school program officially starts its pre-season training today, with bantam having a similar start-up date. Players are allowed to register up until Sept. 15. “Last year we were right around 90 kids where we saw a bit of a drop off where there is a bubble where there doesn’t seem to be a lot of kids. But ideally, where we want to shoot is for 100 kids in the program,” said Jensen. Growing up in Taber, Jensen did not fit your typical physical profile as an adaptable ‘athlete.’ Sprouting up to six-foot-four and 230 pounds by the time he reached Grade 9, Jensen would grow even further to six-foot-seven and 285 pounds by the time he graduated high school. Jensen found himself a place in football and a feeling of belonging of strong camaraderie with his gridiron family as a defensive lineman and tight end. Given the physical nature of the sport in football, Jensen assures the Taber Football Association does everything in its power to make the gridiron game as safe as possible. Taber Football Association was ahead of the curve when it came to implementing the King-Devick concussion testing program. The program was implemented by the Taber bantam Rebels football team back in 2013 with other programs soon following suit. The King-Devick concussion test has three cards that have numbers on them that are spaced in different ways and patterns. You do a baseline time of how long it takes the player to read them before the season starts and the player has suffered no contact. If a player is hit hard during the season and you suspect they may be suffering from a concussion, you pull them off the field and to the sideline, and in less than a minute, you can administer the test. If the player is out by more than five seconds from the baseline time they had at the beginning of the season, a concussion has likely occurred. Jensen also added, Taber Football Association goes above and beyond the base requirements for its helmets. 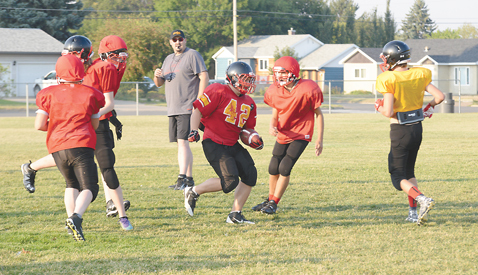 Taber Football Association has also switched up its emphasis on its tackling techniques. Similar to the ‘Hawk Tackle’ technique of the Seattle Seahawks, it was a system that was implemented back in the Seahawks’ coach’s USC days, with Pete Carroll using this system as far back as 2001. Hawk Tackling instructional videos have been sent to 14,000 high school football programs and 8,000 youth football programs in the United States alone, it is making inroads into Canada as well. The college national champion Ohio State Buckeyes adopted the tackling system in 2014. With parents trying to stretch their recreational dollar to the maximum for their kids, Jensen added football fits the bill. For those kids afraid that they have no knowledge of the game, Jensen assured inexperience is not a factor of whether a kid will enjoy the sport or not, no matter how late they get started. If you would like to learn more about registering for the upcoming minor football season or the Taber Football Association, you can e-mail Jason Jensen at jason.s.jensen@hotmail.com.